We are in the midst of the holiday season! You may have had your decorations up since Halloween, or maybe you’re a late bloomer. You still have a little bit of time! Whether you’ve gone with an extravagant exterior holiday display, or you keep it simple with white lights on the Christmas tree, holiday lights can create potential hazards if you’re not careful. 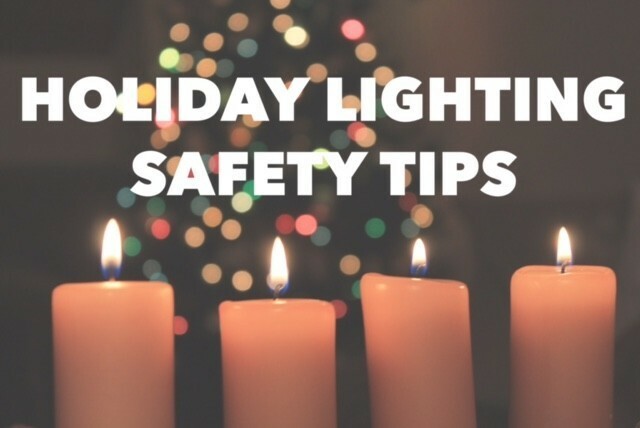 Continue to keep these lighting safety tips in mind for your home the rest of the holiday season. Festive lighting is a holiday decorating mainstay. There is just something about lights that helps make the holidays even more magical. Whether colorful and bold, or subtle and soft, lights are probably on your list of decorating to-do’s. Some people go all out, purchasing bigger, better and more elaborate lighting for displays. Other people drag out the same few strings of lights year after year, perhaps to decorate the mantel, or just the tree. No matter what your decorating style, there is one thing that you should be thinking of: Safety. This is often overlooked in the festivity of the season. Click here for more holiday decorating tips and tricks. Every year, accidents happen that could have been avoided by taking some simple safety precautions with holiday lighting. Even if you’ve already put up your decorations, take some time to observe the following safety tip. One of the biggest risks involved with holiday lighting, whether indoor or outdoor, is fire. Most often, dry Christmas trees and faulty electrical cords are the culprits. Always be sure to choose a tree that is fresh. When you start noticing brittle, dry needles that are falling off, it’s time to take the tree down. Keep your tree watered to keep it fresh for a longer period of time. Keep your tree away from heating vents and fireplaces. Extension cords are another risk factor. Always inspect extension cords to make sure they are intact and not showing signs of wear or breakage. Be sure to replace your light strings periodically, and check them to make sure they’re in good working order. Consider replacing older sets with new LED lights. Consider using the battery-operated candles. Don’t ever leave candles unattended. Don’t set candles near Christmas trees or other foliage. Keep candles high up and away from children and pets. Holiday lighting adds a beautiful touch of festivity to all your holiday decorations. Your holiday season is sure to be memorable and worry-free when you keep these safety tips in mind. Would you like to decorate a new or remodeled home next year? Get ideas and inspiration from our project photos.